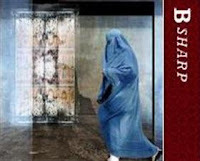 Sam Hawker and Tangent Productions in association with B Sharp present HOMEBODY / KABUL by Tony Kushner at the Belvoir Theatre. “Oh I love the world! I love love love love the world.” Later. “I love the world. I know how that sounds, inexcusable and vague, but it’s all I can say for myself, I love the world, really I do….. LOVE” Later still. “The dust of Kabul’s blowing soil smarts lightly in my eyes, but I love her, for knowledge and love both come from her dust.” Homebody speaks to us for almost 40 minutes. She then disappears and her knowledge and love become part of the dust of Kabul and Mr Kushner leaves one with ones eyes smarting lightly with the love of the disappeared Homebody, Mrs Ceiling. I have knowledge of a world and love for a woman that I otherwise might never had known. Gillian Jones enters from the audience entrance aisle speedily as the lights dim in the auditorium and turns to us with a book in hand, as Homebody, and begins to speak to us, to whoever, to whoever wants to listen. She begins at a briskly galloping pace with a vocabulary of daunting yet attractive hyperbole (English spoken with a vocabulary that is simply bejewelled with knowledge of words and a love of them. Eg. aggluminates, epergne, quizilbash, "portmanteau chemical cocktail" etc and with an ornate syntactical structure of the most demanding architecture) It is thrilling. However, Homebody apologises “I speak….I can’t help myself. Elliptically. Discursively.” And then tells us “You must be patient. There is an old Afghan saying, which, in rough translation from the Farsi, goes: "The man who has patience has roses. The man who has no patience has no trousers." Mr Kushner is delightfully fiendish in his circumlocution of his text. (See, how catching it is!!) And thus, he is fiendish in his demands on his actors. And Gillian Jones is astonishing in her feat of acting She is not bedevilled by any of the tasks that Mr Kushner has given her. She is a worthy handmaiden to his skills. And we, the audience are privileged to be witness of the merging of their gifts. Be patient, (listen) and you will have roses. One of my favourite aphorisms about what I think acting may be is: Acting is Possession.Then Ms Jones is possessed by the spirit of a woman more comfortable living in the world of books and finds inspiration in an outdated guidebook about the city of Kabul. The year she reads is 1998 but the book she reads was written in1965. The intoxication of the book tempts the Homebody to another world then that of a British woman in her forties subdued on antidepressants and she travels to Kabul on an outmoded dream of orientalism and is subsumed into its ether. The highly strung woman of real educated delicacy and fragility disappears in the real world of Kabul in 1998. Gillian Jones is astonishing to watch and participate with. The second half of the play is about the search that her daughter, Priscilla, and her husband, Milton, have in the city of Kabul for Homebody who may or may not be dead. We meet a collection of characters that are fascinating to those of us, who like Homebody, have only a vague knowledge of the reality of the contemporary world of Afghanistan and its city Kabul: "The Grave of Cain. Murder’s Grave." Reading other critic’s notices in the foyer of the theatre there seemed to a consensus that the second half of the play is not as well written. Now, that may be true, but in my estimation, to a relatively small extent. Why the second half of this production of HOMEBODY/KABUL is less successful is I believe the fault of the Director and some of the acting. The Director (Christopher Hurrell) has miscast and/or misdirected or most probably not directed some of this work closely enough. As soon as Lotte St Claire as Priscilla enters the stage with the other characters of Scene two of the first act we know that this performance has not the consistent energy or focus of narrative skills to keep the pulse of the play alive. (In basic skills areas Ms St Claire uses a dialect that is so inconsistent and wayward (she is not alone) that any effort to even believe the predicament of the character is undermined by the distraction of an actress struggling just with her sounds.) The energy is also inconsistent. Occasionally it hits a throttle that feels right. This usually happens when the character is in an angry spiteful flight of attack. There is a noticeable absence of presence when the character is listening. It is almost as if the actor is resting before her next turn. The hesitations in her dialogue cueing, an even internally within some speeches while she searches for the motivational “feeling” to begin, allow the audience to lose impetus and instead of being kept chasing the scene are given the opportunity to observe an actor in process. It is entirely distracting. This should have been attended to by the Director. This approach to the text is I believe stylistically wrong. However as the director has allowed this principal performer to pursue this method of attack, essentially a "method" Stasbergian approach (suited to say to the playing of Chekhov) instead of the high stylisation of language and agenda theatre (let us say Ibsen), hence her partners in support, let us say Mr Llewellyn-Jones and Mr Papademetriou are forced to play in a similar style in their shared scenes and so the material becomes flabby and loses shape and narrative direction, as we are forced to attend to character and given circumstances which are essentially secondary to the interests of the writer. Think G.B. Shaw and you begin to find the territory of playing. How did I come to this realisation? Because mid way through the second half of this play there enters another actress, Odile Le Clezio, who has the measure of what Mr Kushner requires, to play well. A dynamism of focused powerful energy funnels her artistic craft into a clarification of the writer’s debate and method and this is despite the linguistic challenge of speaking in three languages during the scene (English, Dari and French!!!) I knew what was going on and I was swept into a place of great anguish and fear for the character, Mahala. Even more marvellously in a later scene when Mahala is threatened with been shot and there was a terrifying moment of real fearful terror leaping from the body and face of this consummate actress, Ms Le Clezio. It was for me a paralysing moment of recognition of the possibility of violent extinction, my own mortality. Here then was the marrying of both styles of acting. Kushner like Ibsen, Shaw and Stoppard demand both for their material to truly come to life. To a lesser, but accurate extent, Keith Agius as Mullah Aftar Ali Durranni in the penultimate scene of the play, achieves the chilling tone of humanity and yet the warring need to enact implacable rules. The combination of objective and subjective experiencing at the same time. So, here in this one production we have two different approaches to the text and solving its problems. The director had the solution for some part of his production (Observe Ms Jones and Ms Le Clezio) but has not been able to persuade or guide all of his cast to that end. When I look back at the other work of Mr Hurell’s I have seen this year, MEN, LOVE AND THE MONKEYBOY, I notice that I had similar unease about most of the acting. When I look at the credentials of Mr Kushner and compare achievement, I would tend to blame the Director rather than the Writer for the longueurs of the second half of the play, that others have commented on. Define the difference between direction and writing. I believe the writer still comes out with the respected credentials here. (Though I agree, arguably, not entirely perfectly.) Mr Hurell expresses some awe as to the skill of the writer but there needs to be, to pass that on to the play going public, a much more rigorous application of directing skill. There is also responsibility in this awesome task. The Set design (Tom Bannerman) has a beautiful image of an old fashioned, wooden, opaque window beautifully lit from behind. A bare chair and cloth swathed about he rest of the room. However, I do believe there is an over reach to a too busy Art Direction in the choices of the later appearance of the hats and also the painting of the second scenic walls etc. The costumes (Amanda McNamara) whilst also undoubtedly both beautiful and clever are essentially over ripe in the affect that they contribute to the story telling. The lighting (Grant Fraser) is in the first section atmospheric and later very supportive to the design ambitions. The Sound composer and designer (Rosie Chase) makes significant and subtle contributions to the telling and atmosphere of the play. The look of the production is just a bit “decadent” in its richness for my taste. It is still an achievement and could compare to the main stage appearance: Yibiyung, upstairs. Mr Kushner wrote: "HOMEBODY/KABUL is a play about Afghanistan and the West’s historic and contemporary relationship to that country. It is also a play about travel, about knowledge and learning through seeking out strangeness, about trying to escape the unhappiness of one’s life through the encounter with Otherness, about narcissism and self-referentially as inescapable booby traps in any such encounter; and its about a human catastrophe, a political problem of global dimensions. It is also about grief.” This is a tall order for any company of artists to deliver. We only get some of this clearly in this production. Now this is a C0-Op Production. Just to clarify what this means. This means not a single member of this artistic team is receiving any recompense for presenting this work at the Belvoir Theatre. All of these artists have toiled in their own time to struggle with this great contemporary writer’s work out of a love for their art/their job and in a sense of the responsibility that the Artist may have in the fabric of their community, to their community. In this case, to show humanity in all its struggles to be human in the world we live in. A major and historic endeavour. When you look at the names of some of these artists you will see how amazing the commitment of these highly esteemed artists is. There are few writers that may attract that level of sacrifice and devotion. I do not believe that I have seen a better performance from an actress, maybe actor, this year in Sydney than that of Gillian Jones as Homebody. Ms Jones’ passion to toil on this character and text does us her great honour and I urge you to see her in this enterprise, if, for no other reason then to compensate her with appreciation of excellence as she is certainly is not earning a living wage to do this. As are none of the others. This performance of Ms Jones is worth knowing. Playing now until 5 October. Book online or call 02 9699 3444. I am a tremendous fan of the work of Mr Kushner, so it was with some apprehension that I travelled from Melbourne to see this production, although somewhat inspired by the 'esteemed cast' that you refer to: I had seen some of their great work before, in particular Jones and Papademetriou. I was not at all disappointed. I was made aware of your blog reviews only recently, and was amazed to read the comments, although being a blog site being subjective, you are - of course - at liberty to write what you will. Similarly, as comments are available, I felt I had to just send my own short opinion: I felt your focus on Lotte St Clair most unfair. Her accent does indeed waver in parts (although I note you do not mention the consistent but incorrect accent of Miss Le Clezio who juggles several languages well, but speaks with a decidedly European/English accent and not with one that would belong to a Kabulli woman - I know, I deal with these people all the time). I also felt it was unfair to single out your other actors when ALL the cast act in a splendid way - if it wasn't to your liking that is fair enough, but your presentation was more of judgement and critique. If anything, I felt the play suffered from some overwriting and length. I was amazed to read these people get no recompense from what I consider to be an excellent production, and am also amazed (having done a very minimal websearch on your own credentials) that you would 'bag' a production in this way when it is the very support of this kind of theatre group and work we should be encouraging. I note your support towards to the end of the review, but this is like flogging someone and then offering them a helping hand up. I doubt whether many people read your blog) given the lack of comments posted, so I hope this does not have a serious effect on the actors or the production, but whoever is reading your review and susequently - I hope - my own comments: SEE THIS PRODUCTION.